The ECS G33T-M2 motherboard overclocks to a pretty unimpressive 335MHz Front Side Bus. Does the Intel G33 Express Impress? In terms of integrated video motherboards, for Intel or AMD, the performance difference between chipsets is almost negligible these days. The scales tip in the Intel G33 Express's favor because the Intel Core 2 Duo processor is faster than AMD's Athlon64 series. The ECS G33T-M2 motherboard is a good simple mainstream platform for 2D tasks, like regular office work, surfing the web and the like. The onboard Intel GMA X3100 handles 2D applications just fine, and can be used with Windows Vista Aeroglass because it's compliant with DirectX 9.0C. In the benchmarks we saw that the ECS G33T-M2 motherboard's integrated video outperformed the nVIDIA GeForce 7050PV and AMD 690G, largely because the Intel Core 2 Duo processor is more powerful than the Socket AM2 AMD Athlon64 X2 5000+. The chipset itself is a weaker integrated videocard than the either nVIDIA or AMD solution however. When it comes to 3D games the ECS G33T-M2 motherboard performs faster as long as you have a quick CPU to use. If you want to do gaming the Intel G33 Express gives you similar performance to the nVIDIA GeFOrce 7050V and AMD 690G. With a PCI Express x16 videocard is installed the G33 Express has the advantage of being backed by a Core 2 Duo processor. The ECS G33T-M2 motherboard is as about as future ready as you can get, supporting Intel's upcoming 45nm CPUs, as well as 1333 MHz Front Side Bus (FSB). 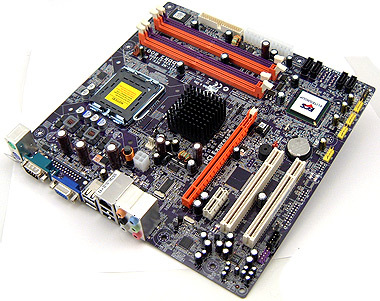 The board is DDR2 only, most motherboard makers are only releasing one or two models with DDR3 capability as DDR3 RAM is not expected to really take off until mid 2008. The ECS G33T-M2 motherboard handles itself well in 2D applications, making it as fast as other Intel Core 2 Duo platforms. If you're a gamer the GMA X3100 integrated video is simply not enough, you'll need to get yourself a PCI Express x16 videocard for sure. The nVIDIA GeForce 8600GT/GTS is a good place to start. Overclocking was a no show. With a retail price of $110 CDN ($105 USD, £51 GBP), the ECS G33T-M2 is an economical entry level motherboard with integrated video and almost all the ports and connectors a typical SOHO user will need. There's not much fluff here, so the G33T-M2 is really just the basis for good workstation PC.